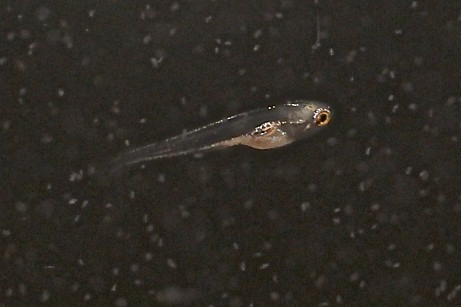 I was taking some pictures to illustrate what a larval fish and its food looks like. 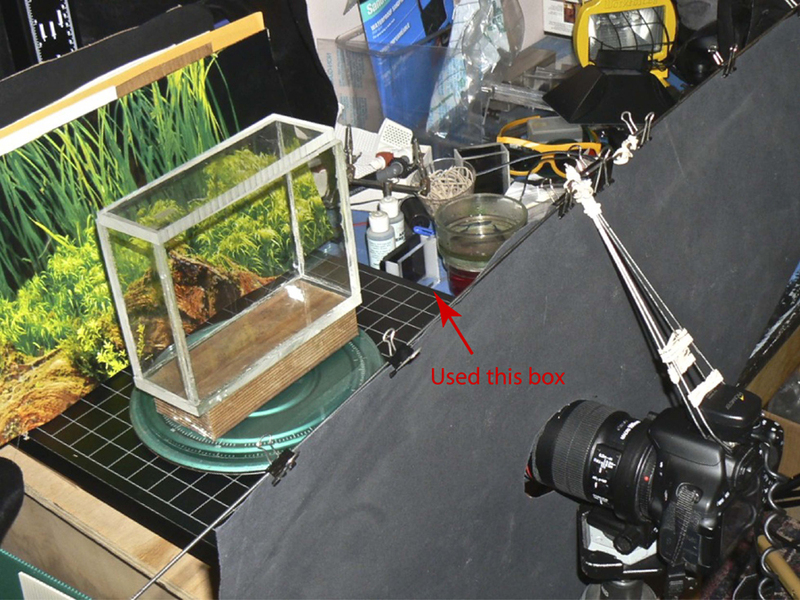 The back of the small box is transparent grey, like a neutral density filter. Room lights are off when taking pictures, but I have some illumination from a light on the right so I can focus. The brightness of the flash should flood out the other light. This is a Devario annandalei (Burmese Blood Red Giant Danio) larvae that is 3-4 mm long. 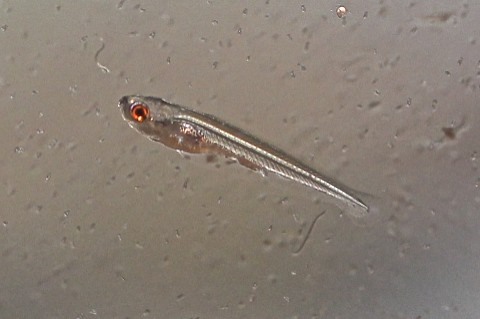 The small spots around the fish are rotifers. The worms are Walter worms. This shows internal structure (the fish is pretty clear at these stages). The long bright tube-like thing is its notochord which provides the animal with its longitudinal support until its vertebrae develop. The slanted lines crossing the notochord and below it are the borders between neighboring myotomes (segmental muscle blocks). This looks a lot like phase contrast or differential interference microscopy. Normally, this is based upon a single coherent light source, illumination from an angle so the object is on a dark background and only refracted or reflected light shows up. I think it looks nice and am interested in trying to get this effect reproducibly so I have been considering the lighting conditions that could have created this. I don’t think of the flash above the tank as a particularly coherent light source (which makes interference work better). Currently I am thinking of the first fish picture as a dark field picture (which was expected) while the second one looks more rounded with highlights and shadows that looks like interference of some kind.